Russia is going to get hurt more and a part of the shock wave would touch the world markets too. But I find that more risky assets are going to go for a wild burst affecting the global markets. The depth of the burst is over $9 TRILLION worth of potential explosions waiting in the wings. If crude prices don’t come up then global currency as well as the equity markets and risky bonds are just going to explode like time bombs. Remember we did not account the plunging home prices of US and at that point of time we were all rejoicing the equity markets growth forgetting the economic calculations. 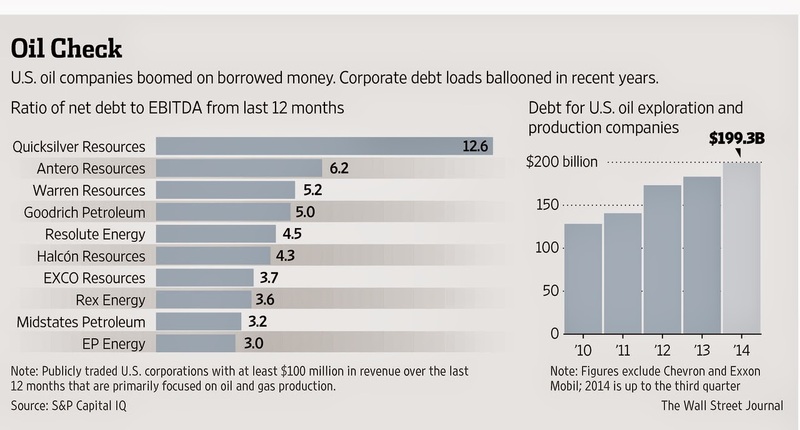 Russia has borrowed heavily in terms of dollar due to Debt repayments from companies and banks got ripe. Around $50 billion have been raised during Oct-Dec and the number is simply growing up. Slide in the crude prices has also lead to significant growth in dollar borrowings as companies are unable to meet their debt obligations. But the hammering of the global currency would come when the dollar rallies and these borrowings become more expensive to finance in relative basis. Most of the “recovery” of the last five years has been fueled by cheap borrowed Dollars. Now that the US Dollar has broken out of a multi-year range, you’re going to see more and more “risk assets”. The biggest risky asset is the oil junk bonds and also the derivative contracts across all segments. The big banks are holding trillions in commodity derivatives that could blow up if the price of oil does not rebound. 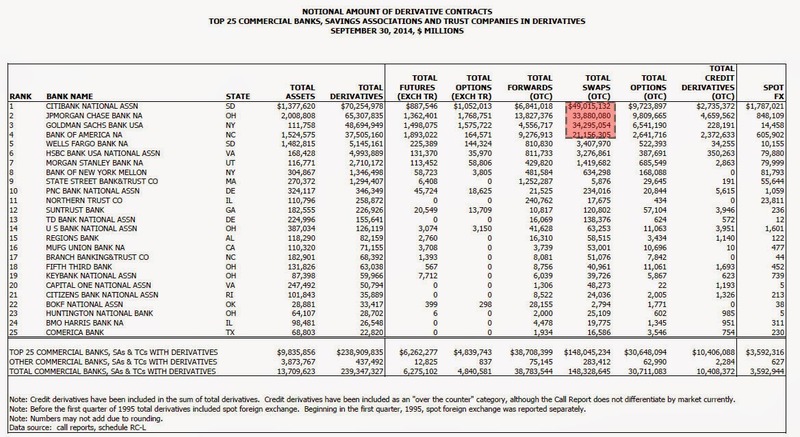 Overall, there are five U.S. banks that each has more than 40 trillion dollars of exposure to derivatives of all types, and the total global derivatives bubble is at least 700 trillion dollars at this point. Now the threat is this that if crude which is a ancillary commodity product of many commodities. Now if crude prices increases all derivative contracts get justified valuations otherwise the loss is not possible to be calculated. Through derivative contracts high valuations of crude have been hold and hence there is high risk that they might boil down. Now thinking politically a war in any part of crude exporting country would be sufficed to drive the price up and support this plunge. But don’t get into wild speculations. So the oil companies that have locked in high prices for their oil in 2015 and 2016 are feeling pretty good right about now. But who is on the other end of those contracts? In many cases, it is the big Wall Street banks, and if the price of oil does not rebound substantially they could be facing absolutely colossal losses. It has been estimated that the six largest “too big to fail” banks control $3.9 trillion in commodity derivatives contracts. And a very large chunk of that amount is made up of oil derivatives. By the middle of this year we could be facing a situation where many of these oil producers have locked in a price of 90 or 100 dollars a barrel on their oil but the price is around the level 50 dollars a barrel. In simple terms an oil derivative typically involves an oil producer who wants to lock in the price at a future date, and a counterparty – typically a bank – willing to pay that price in exchange for the opportunity to earn additional profits if the price goes above the contract rate. The downside is that the bank has to make up the loss if the price drop Noble Energy and Devon Energy have both hedged over three-quarters of their output for 2015.Pioneer Natural Resources said it has options through 2016 covering two- thirds of its likely production. Hence those who are making merry Christmas celebration for the low crude prices would land up in huge precarious conditions. The depth is more deep from here. Falling crude prices has lead bankruptcy filing to be on a increasing scale. For example, Continental Resources cashed out approximately 4 billion dollars in hedges about a month ago in a gamble that oil prices would go back up. Instead, they just kept falling, so now this company is likely headed for some rough financial times. The global economy and the interconnected bank transactions are the hidden time bombs which will burst and bring stupendous T-sunami across the financial markets through these derivative products. I find the US citizens are again going to take up the hit of the bankruptcy and the tax payers funds are going to get into bailouts. Yes the world might think that the new amendment law of US to protect the tax payer’s money is sufficient but unfortunately the policy makers created a loophole into the system.Find below the list of Banks position in derivatives: Well the list is Q1 2014 and hence updated numbers would be on the higher side. Under the Lincoln Amendment, FDIC-insured banks were not allowed to put depositor funds at risk for their bets on derivatives, with certain broad exceptions. The rule would have impacted the $280 trillion in derivatives primarily held by the “too-big-to-fail (TBTF) banks that include JPMorgan Chase, Bank of America, Citigroup, and Wells Fargo. Although 95% of TBTF derivative holdings are exempt as legitimate lending hedges, leveraging cheap money from the U.S. Federal Reserve into $10 trillion of derivative speculation is one of the TBTF banks’ most profitable business activities. Hence stop praying for low crude prices.If crude prices don't increase all derivatives would go for a wild burst. Last time I have covered about the practicing profession needs to be taken ahead. I found many appreciable comments and I also found the readers particularly the new comers in the profession of Cost Accounting are looking ahead for the same. Well today I will discuss about certain areas where the working cost accountants who have joined the fraternity would require in order to climb the corporate ladder. I have found that new comers into the profession are mostly shaking and feel like worms snail on the ground as they have limited exposure to the field and also they have a feeling that they are only New Comers. Time has come to change and change should be reflected within your body language. This is one of the biggest wrong mindset they develop once they qualify. The biggest mistake they blindly follow the seniors and behave like slaves of them. I might have hurt your emotions but what I felt form the body language I have told you the same. You must accept that your days of being a CMA student are over and now you need to fit into the shoes of the corporate life irrespective of practice or service. You need to move ahead of your own domain of knowledge of cost accounting and learn wide range of subjects which will help you grow and build your career fast. I will be discussing few areas where you will just needs to abide consistency and you will find compounding affect on your career within a short span of time. Well the speed of doing depends on you which will set the pace of growth. Your are the one who can make dramatic changes in your future life and Institute. What you need is a recipe to build your self confidence in your career and professional life while as a CMA. I have heard and you too that often seniors ask to think big and dream big. Well do that you need to read books so that your mind gets foods for the same and then you become day dreamer. Until you need the road map how you will reach the destination is big question of thought. Knowledge is not limited and has no barrier. Pick up books of marketing and start reading them. Yes suddenly I jumped into marketing since that is the key area where we all lack ourselves and we feel like snails. Hence pick up marketing books which you find easy in reading and understanding. Take a copy and make note form the ones in your own language. This will help you to understand how the business is being marketed. How the world of marketing moves and how strategies are being developed to market the same. The more you read on the subject you deve.lop your thoughts and foods for the same. This increases your knowledge level and also gives you words to speak. Read books rather than getting sermons form the seniors as they have their own vision based on which they will impose their thoughts within you. Now these words to speak are the most important aspect as when you have to be present among few learned and experienced friends, community or social gathering. These words and thought would help you to create a mark and would spate you from the mass. Remember your college days are over and hence you will hardly find some one in the subject topic lines you learnt while doing your CMA course. Read books on case studies of business where you acquire global knowledge of running business, success stories of business, cost management etc. In between I forgot to mention that many of my young friends are weak in English. Well get into a British council English speaking courses and learn from there as these institutes have well trained programme for the teaching of the same. Avoid local speaking classes as they might deprive you from the same level which is required in the profession world. This is one of the biggest area which will make you feel shaking and nervous in getting in to the higher cycle of your career. Don’t feel that you are incapable time teaches many things and helped us to adjust many thing. In similar ways get up spend your earnings on quality improvement. This is the key area of investments which is required for an early cost accounting career. The one who does investments in education never finds decline in his professional career. Hence save your earnings and invest regularly. Now reading books and doing English course were the preliminary areas which you need to grow. The more books you read on variety of subjects-remember there are many subjects which are of less relevance to your profession or job in the initial days but later on you will find that these subjects are helping you to climb the career of your corporate ladder. Hence read as much as you can–make note of the same and discuss the same in social websites. Change the topics of your friends circle, this will help you to grow your knowledge and also this improves the quality among your circles. Join rotary clubs and other business clubs where you grow your corporate groups and friends circles. The biggest advantage is that you get to learn many things at one stroke. Exchange visiting cards and be an observer in the initial days. Don’t open your mouth to prove that you are smart. This will land you to loose many relationships beforehand. Learn and observe as you are new to this culture hence just learn. Once you are a regular visitor and people start liking your presence then plays your cards slowly. The biggest advantage of being a late starter is that you get time to learn from reading books and others body languages, presentation skills etc. Join every social gathering business segments so that you can learn. Remember that knowledge is free and is abundant. The one who takes the gut to drink the whole cup is the winner. Create small groups of friends and get into different business membership groups. Move in groups so that you don’t feel shaky. This will also boost your long term relationships with your friends who might be colleges tomorrow. Now one of the biggest requirements of the decades is that while in your corporate life or in your practicing you need knowledge about excels and other type of applications. Forget the one you learnt in the Institutes since it is just basics. You need to learn excel modeling of financial valuations, advanced excel as these are the tools which will be required for your every day’s life. Again I am repeating move ahead from your requirement levels and stretch your selves above of the same. The more you learn the more value and premium job offerings you start getting. Seniors would be able to provide some small break through but the big ones and scaling the career growth will come from investments in education. There are many reputed organization where these training are provided. Ask your seniors to guide you regarding the place where such excel modeling is being taught. All these will add core values to your career when put together. Only attaining meeting of the members meet at Institute would not be of much help. I have heard that members compliant that the institute don’t provide much support for the growth of the profession. Well I don’t want to get into the debate but remember that over the next 10 years you will be replacing the one who is sitting on the Dias of today hence stand and grow up, improvise yourself and get yourself ready for the future. Just look back 5 years back to your life and the current time-what you find is a stark contracts and do remember the next 5 years would be more changed. Hence prepare for the next 5 years. A special thanks to Amit Apte for some inputs. The world economy is set to slowdown in 2015 followed with extensive pressure on currency across the globe and to end up with asset bubbles going for blow up. Japan has declared that its economy is in recession, China is already under slow growth, Europe is struggling with its austerity measures and US is less to be relied on growth. Among all these low crude prices has killed the remaining part of the world economic growth.The recent ratings of Russia was very much expected in the lines but we should be expecting some more as major oil producing countries are taking the hit over the low crude prices. In my previous I depicted that losses of the exporting countries and where countries like India are going to stand when their will be slow down in these exporting countries of India. 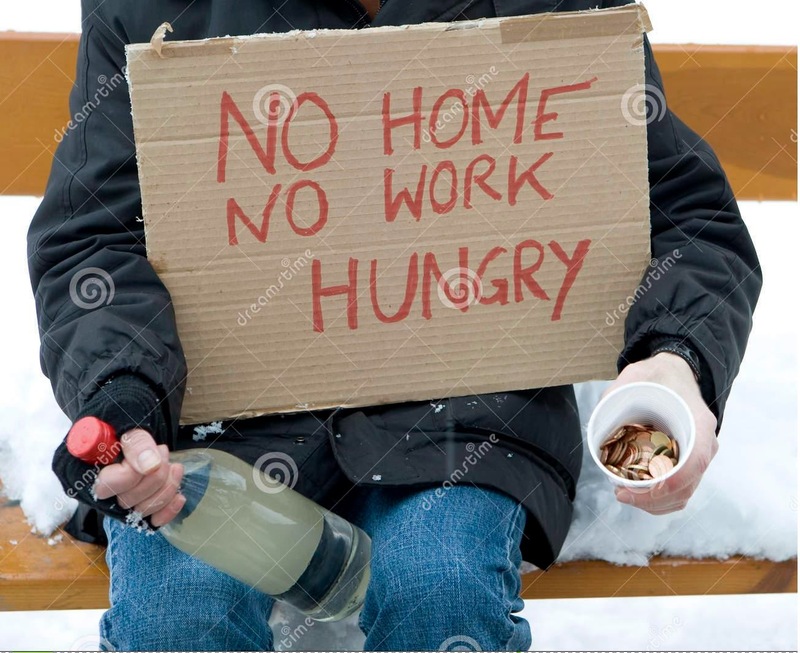 Global unemployment is also going to increase and the biggest blow would come to the new comers who will be finding difficulty in getting job as budgets would be reduced by the oil producing countries and exporting the same. Unemployment is linked with investments, but the recent low crude prices and further expectation of fall from here have already created bankruptcy alarm for many crude producing countries. Investments have dried up as the time lag for the investments and the crude production become killing aspect when the crude prices are low. This increases the cost of debt by double as the current debt becomes a burden further the new debt becomes a challenge. The current Debt to EBIDTA is clearly reflecting the US crude producing company’s current status: In 2010, U.S. companies focused on producing oil and gas had $128 billion in combined total debt, according to financial data collected by S&P Capital IQ. As of their latest quarter, such companies had $199 billion of combined total debt. The group doesn’t include Exxon Mobil Corp. and Chevron Corp. which also make money from refining, chemicals and pipelines. If we add all these numbers of these companies the deficit grows by few more billions. Further during 2008-09 crisis when crude prices came down globally due to lackluster demand middle east and many economies did extensive investments in crude production to revive the investment climate. Hence when crude prices touched the level of $100/ barrel during 2010-11 don’t think that all the major oil producing countries made windfall profits as they have already deployed the capital for investments. Hence new investments are next to dead. The cost of production is now turning out to be a loss as many oil companies have huge capex capitalized over several years. Further operational cost of the oil producing companies is also too high. All these cost makes the production to be high hence a price above $ 60 or $75 per barrel is required. Now when bankruptcy has started which means that no employment opportunities simultaneously slow growth for these economies. Russia, with 10.6 million barrels a day in October according to government statistics, and oil there costs between $50 and $52 a barrel to pump. US is having a cost of production ranging from $40 a barrel in the Eagle Ford Shale to $80 a barrel in North Dakota and $82 in the Permian Basin where as in Canada, where oil ranges from $46 to $90 a barrel. Hence US is already at a bubble. Further in my previous articles about the junk bonds issue by the US crude producers have turned to be a bubble getting burst in slow mode. http://www.ianalysis.co.in/2014/12/asset-bubbles-to-explodejunk-bonds-of-us.html.The Middle east is in the best position in terms of cost of production. Saudi Arabia has the world’s lowest cost of production at $10 to $25 a barrel, according to a Scotiabank Equity Research and Scotiabank Economics report published in November. 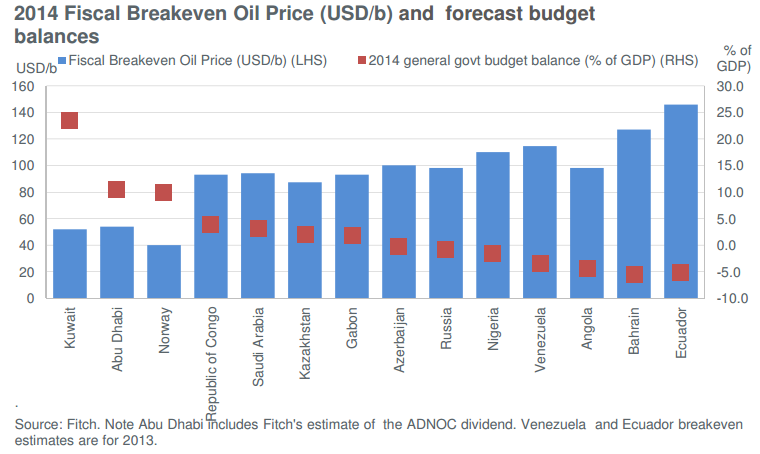 Other OPEC countries need more money to cover costs ranging from $15 to $30 a barrel. But we did not take the cost of running the budget of an economy. If we add that the current average price of global crude production which is $50 a barrel stands very high when cost of running the economic budget gets added. According to an assessment from the Federal Reserve Bank of Dallas, an estimated 250,000 jobs across eight U.S. states could be lost in 2015 if oil prices don’t rise. More than 50% of those job losses would occur in Texas, which leads the nation in oil production. The ancillary industries linked with OIL RIGS are also going to get hit as demand for the products are drying up hence a significant cut down in production ,mass layoff and slow growth. Less drilling will not only lead to a loss of jobs for oil workers, but the services that pop up around drilling sites – restaurants, bars, construction, and more – are feeling the slowdown as well. Companies have sprung up during the shale boom to build metal, machinery, pipes, electrical equipment, chemicals, and other support services. All these are on the path of getting closed. In Russia-western sanctions over the crisis in Ukraine and a more than 40% decline in the price of oil, Russia's key export, which has dragged the ruble down 45% against the U.S. dollar this year. Inflation is soaring as the plummeting ruble raises the price of imports, and Russia's ban in August on select food imports from the U.S. and EU has further pushed up food prices. On the reversal side these economies are not finding production of food items to be feasible hence cut in production in US and EU is already began-which adds fuel to the slow growth of the world GDP. As inflation climbs and companies cut spending, Russians' real wages declines. In short we unemployment is slowing and silently growing. The difficult part of the current status of the global market is that all these oil producing countries have foreign exchange based investments. Now with the scenario the debt burden and new rating given by Fitch, S&P, Moody etc are going to push up the cost of borrowing and sharp depreciation of the local currencies. This will spook inflation for commodities despite of not having much demand of the same. The Russian government has about $150 billion of debt it needs to redeem in 2015, much of which is foreign held. Sanctions now bar many state-owned Russian credit institutions from borrowing long-term money from Western capital markets. Russian firms are scrambling to repay or restructure the terms of foreign currency loans. Further according to the reports form Fitch- Bahrain, Angola, Ecuador and Venezuela rank as the emerging markets (EM) are the most vulnerable to a downgrade in their sovereign credit ratings if oil prices do not recover in 2015. The other measure of vulnerability is the extent to which a country relies on oil for its fiscal revenues, with Saudi Arabia, Bahrain, Abu Dhabi, Kuwait, Congo and Angola leading the way (see blue bars in the chart below). The red bars show the proportion of the current account inflows that derive from oil. A low ratio denotes a greater potential for a country – such as Mexico – to rely on non-oil exports when the oil price slumps. In my previous article I covered the aspect that India will not be benefited much as the country is heavily dependent on export. Now with slow down of exporting countries followed with Japan, China and weak growth of Euro-zone leads negligible condition for these countries to find consumption growth. Hence Indian exports are going to take a hit and also the fiscal balance. World GDP is already witnessing slowdown and it will witness more slowdown in the coming days unless crude prices rise. Note that we are living in globalized trade world where all business and capital are mixed. In my previous articles I was discussing about that cutting down on taxes and improving the investment and macro economic development is the best strategy rather than opting for austerity measures and government investments. My recent research is hovering above the theory of reducing taxes the boost investment climate compared to traditional QE policies. According to the Keynesian economics lowering taxation rates boost household savings which leads to consumption and further inflation. US economy is currently struggling to get inflation which will reflect that manufacturing & consumption both has started. Today we know that 60% of the US corporate cash reserves lies outside of US and they are reluctant to bring the same back home as taxation rates are high. John F. Kennedy became president of the United States in 1961 brought Keynesian ideas to discussions of economic policy at the highest level to expand national income by reducing taxes was adopted. The result was outstanding which looked like Growth in real GDP was 5.3 percent in 1964 and 6.0 percent in 1965. The unemployment rate fell from 5.7 percent in 1963 to 5.2 percent in 1964 and then to 4.5 percent in 1965. The history was repeated again in US. When George W. Bush was elected president in 2000, a major element of his platform was a cut in income taxes. Congress passed major tax cuts in 2001 and 2003. After the second tax cut, the weak recovery from the 2001 recession turned into a robust one. Growth in real GDP was 4.4 percent in 2004. 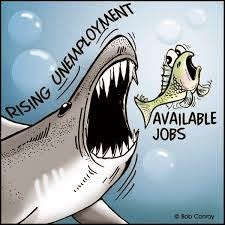 The unemployment rate fell from its peak of 6.3 percent in June 2003 to 5.4 percent in December 2004. This clearly reveals that government austerity and public investments strategies fell short to spook growth as lowering taxation has done. Boosting the household cash reserves is the best way to build confidence among the consumers. Further low taxation pushes up investments. Historically we have seen US have reduced interest rates to push up investments which have worked well but this time it did not turn up since unemployment numbers are still a mystery itself. Hence the best way to do is lower taxes makes goods and services cheap & increase household savings . 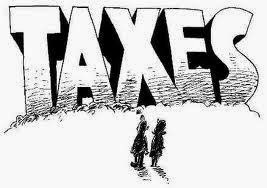 Further lowering taxation increases entrepreneurship and business investments climates. I find in my research that time has come when the government should avoid the public participation of investments along with private. Since currently in US and in other economies including India we find that the governments are not the best person to identify the feasibility of infrastructure projects. China and US currently are building infrastructure which is not currently in demand or not required. This pushes up asset bubbles and false economic growth numbers which are unsustainable in the long term further their create glitch over the long term growth of the economy. The government must understand that private investors are more hungry to get healthy ROI hence their investments road maps are more perfect and not biased with political climates judgments. The world economy needs to understand that investment climates are changing and government 5 years term based investment decision are wrong and burden over the long term economy. Reducing taxes would attract more Research and Development as cost of operating would reduce and business becomes more profitable. The problem with the developed economies is that they don’t want to lower taxes as they want to keep their income levels same as it used to be in the year 2000. If we compare the recent government incomes from the taxation every economy has tried it best to keep the income at the same level. 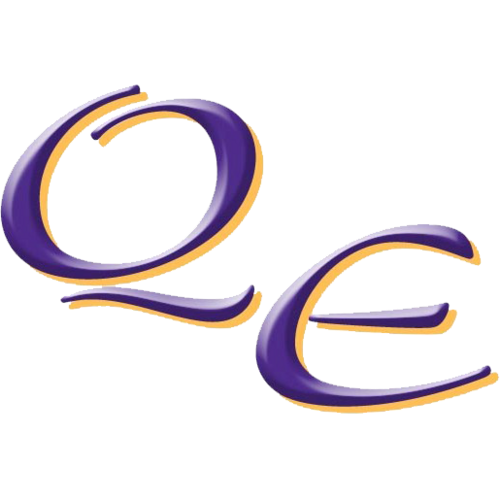 When we all know that QE is a burden on the economic balance sheet why not to twist the QE in the form of Taxation benefits and push up the growth engines of the economy. Why US is not lowering the domestic taxes for the overseas investors who are sitting on a cash pile of more than $2 trillion. Lowering interest rates would not help as taxation would eat up the profitability higher compared to interest cost. Economic history clearly shows that reducing taxes pushes up growth and recently as its being expected that US economy would raise interest rates well high corporate tax followed with interest increasing –how you plan to start your business in US. Further interest rates should be used as regulator to control the inflation and liquidity. It can be used to push up growth where cost of taxation is high. Investors might be happy to pay interest rather than paying high taxes which eats their immediate profit and growth projection abilities. The US government forgets that it’s a globalised economy and setting manufacturing base and replacing country for starting business is very easy and zero restrictive. Hence before increasing interest rates lower the taxation rates so that business grows. The same is applicable for the Euro-zone that QE should be in taxation form and not injecting liquidity into the system creating bubbles for a long term catastrophic collapse. The developed and developing economies should understand that public participation in projects should be reduced and make it more feasible for private should be prime aim. The cost borne by the government under these projects should be utilized as taxation incentive to the private to make these projects 100% feasible for the private. Corruption is another bottle neck which takes birth form the government ends and creates short term useless influence to create assets which will not be required in the recent times. This creates zero ROI based projects and finally private investors run away from these proposals even in times of healthy proposals. We need re-modeling of the QE & government expenditures. The whole world is eagerly waiting for the Quantitative easing to be provided by Euro-zone so that asset bubbles and speculative growth projections could be taken and the stock markets are being rallied to new heights. By QE the whole world takes it as printing of money for the system and zero interest rates. As a economist I find that QE of the Eurozone should be designed where taxation benefits are being given in Consumption, Labour and Capital. We don’t need QE in the form of asset bubbles but in economic benefit where the end user as well as overseas investors gets attracted to the country. I will discuss 3 key areas of Taxation system where I find change is required to bring growth over the next couple of years. You may come up with QE to pump liquidity in the system but that will be for short term and also circulation of capital will not happen. 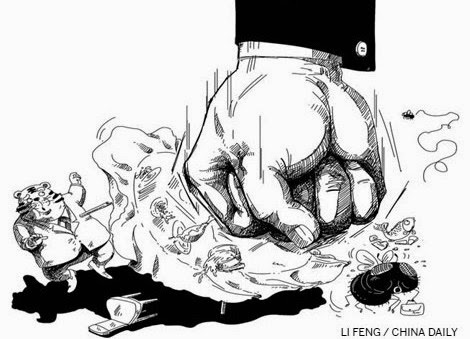 The resources will be trapped to certain part of the capitalist community rather than flowing to the economic factors. QE should be circulation of capital and that’s will only only happen when the same is designed to give taxation benefits to the euro-zone people across the 3 key areas. · In 2012, the overall tax ratio, i.e. the sum of taxes and compulsory actual social contributions in the 28 Member States (EU-28) amounted to 39.4 % in the GDP-weighted average, nearly 15 percentage points of GDP over the level recorded for the USA and around 10 percentage points above the level recorded by Japan. Now before going for austerity measures why not adopt the policy of low taxes which automatically adjust the austerity amounts but leading growth opportunities for the industry and economy. Entrepreneurs and corporate will have more surplus at their own ends as taxation rates are low but also the government cuts down its public expenditure adopts the austerity measures at its own ends without affecting the private segment. More surplus would leads to less borrowing and less stress on the banks and more business opportunities would come. Euro area tax revenue as a percentage of GDP remained at a slightly higher level than EU tax revenue (39.4 % of GDP in the EU-28 and 40.4 % of GDP in the EA-18). We need to cut down on this aspect since this will lead to less business and less employment. What we need is that QE should be taxation benefit wise and not printing of fresh liquidity into the system. This will create long term economic investments as tax sops would make employment and business to grow. Once the employment numbers come down –taxation form the employed would benefit the economy. At the same time social cost burden for unemployed will come down. This all will happen only when the taxation aspect is improvised and made user friendly. If we are taking austerity as well as getting QE out of pocket then we need to channelize the same where doing business become aggressive and easy. FDI investments would also become active when the taxation systems become attractive. Labour taxation as mentioned above is the biggest part. Taxes on labour declined from 2009 (19.9 % of GDP) to 2010 (19.7 % of GDP) and then increased from 2010 onwards to exceed the 2009 level in 2012 (20.1 % of GDP). Since 2009, a number of Member States raised the top rate in the area of personal income taxation. Now if Euro-zone wants consumption to happen then obviously one needs capital in his hands to buy the same. Hence this area of taxation needs to be reduced substantially so that even Tourists also find the country to be cheap which also pushed up the GDP growth for the country. QE should be utilized in this way. Giving taxation benefits to the consumption of goods leads more manufacturing to happen which leads to multiple job creation and taxation earnings for the government. FDI investments will also increase as goods and services become cheap and hence volume based earnings start happening in the long term. I have kept the article very short so that it become more brief to the point of issue. Consumption taxes increased from 10.7 % of GDP in 2009 to 11.1 % of GDP in 2010 remained relatively stable to stand at 11.2 % of GDP in 2012. This was mainly due to increases in VAT rates in many Member States resulting in higher VAT revenues as well as resumed domestic demand in most Member States. Low VAT rates would spook consumption for the economy and also it is user friendly for the end user. The current taxation revenue to the GDP is only being focused towards revenue and this is very much clear from the below comparison chart. The problem of Euro-Zone slowdown is the taxation system where no compromise is being executed to cut down the rates since focus is on income from taxation. We are trying to keep the income rates in the same level as it was in 2002. We must understand that we are not in the economic condition of 2002 and we are in the year of 2015 where economic and technological know-how is no more private property. Hence making the investment and economic climate of Euro-zone to be attractive we need taxation reliefs which would make the country attractive to the global world and the domestic ones. QE in liquidity injection into the system would create bubbles but not employment neither entrepreneurship which leads to long term economic growth for EU.